Just over half of Latinos go online, a figure well below the level of adoption for whites. Fifty-six percent of Latinos in the U.S. use the internet. 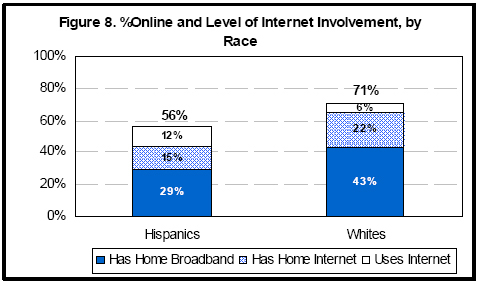 By comparison, 71% of non-Hispanic whites and 60% of non-Hispanic blacks use the internet. 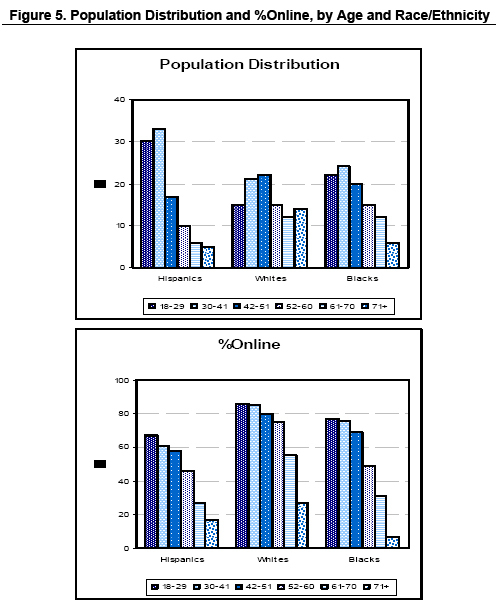 Education and English proficiency are highly significant factors in explaining race differences in internet use. As in the general population, certain groups of Latinos are less likely than others to go online: those with less education, those with lower household incomes, and those who are over the age of 60. Seventy-seven percent of respondents provided information about their household income; 23% did not and are not included in the following analysis. Nine in ten Latinos (88%) with an annual household income above $50,000 use the internet; 72% of Latinos with an annual household income between $30,000 and 49,999 use the internet. Thirty-nine percent of Latinos with an annual household income less than $30,000 go online. Higher income levels are associated with internet use, even controlling for age, education, language, nativity, generation, area of origin or, for immigrants, the number of years they have lived in the U.S. Immigrants and those who speak mostly Spanish are less likely than other groups to use the internet. 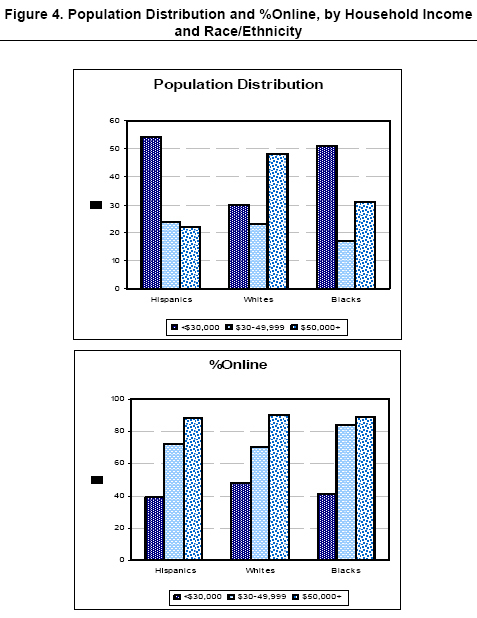 The Pew Hispanic Center has chronicled the effects of language on assimilation, as well as the differences between first-, second-, and third-generation Latinos.14 This survey extends that analysis into the digital realm, showing that speaking Spanish is a significant, independent factor in a Latino adult’s likelihood to go online. The connection between nativity, generation, and internet use remains strong even when other factors are held constant, such as age, education, and income. 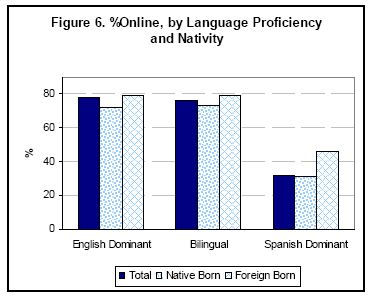 Again, language seems to have an independent association with the propensity to use the internet; foreign-born Latinos who speak English are more likely to use the internet than foreign-born Latinos who are Spanish-dominant, for example. 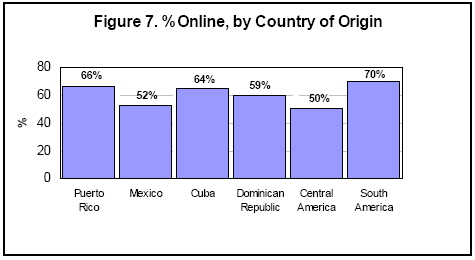 Latinos from Mexico are less likely than those from the rest of Latin America to use the internet. Diversity of national origins is a hallmark of Hispanics in the U.S.15 Each group has a unique socio-economic profile, history, and mix of native born and immigrants, making national origin an essential part of our analysis of Latinos online. Less than one-third of Latino adults have a broadband internet connection at home.